Fishman Corporation recognized for its dedication and commitment toward quality and service. We are honored to have been recognized for our service and selected by Alcon as a 2014 Supplier of Excellence. Fishman Corporation (http://www.fishmancorp.com), a producer of high quality, reliable dispense systems for the application of assembly fluids, has been honored by Alcon with its prestigious 2014 Supplier of Excellence Award. Alcon is the global leader in eye care, and is the second largest division of Novartis. “We are honored to have been recognized for our service and selected by Alcon as a 2014 Supplier of Excellence. Alcon works with many suppliers of products and services, which is why the award is so meaningful. We look forward to continuing to work with Alcon in providing innovative fluid dispensing systems that fit their needs,” said Scott Beebe, President of Fishman Corporation. 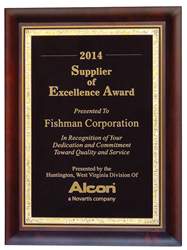 Fishman Corporation was presented with the 2014 Supplier of Excellence Award by the Huntington, West Virginia Division of Alcon in recognition of Fishman’s dedication and commitment toward quality and service. Alcon operates in more than 75 countries, serving 180 markets and offers state-of-the-art surgical, ophthalmic pharmaceutical, and vision care products. Known for its cutting-edge innovation and breakthrough technology, Alcon has transformed the way we treat eye diseases and conditions. Fishman Corporation revolutionized fluid dispensing with the release of the SmartDispenser® which was developed to address global manufacturers’ needs for process control applied to their fluid dispensing applications and web based devices able to network with developing MES systems. The SmartDispenser® fluid dispensing system utilizes AirFree® dispensing technology. The stability of the AirFree® Linear Drive System provides control and monitoring of a consistent, repeatable assembly fluid deposit worldwide resulting in increased bottom line profits through higher productivity, fewer rejects, less fluid waste and lower production costs. Follow Fishman Corporation on LinkedIn at https://www.linkedin.com/company/fishman-corporation, on Twitter at https://twitter.com/fishmancorp, or on Facebook at https://www.facebook.com/fishmancorp. Fishman Corporation produces high quality, reliable dispense systems for the application of assembly fluids. The SmartDispenser® fluid dispensing system by Fishman Corporation utilizes AirFree® dispensing technology to provide control and monitoring of a consistent repeatable assembly fluid deposit worldwide.